There's little point writing posts when Clara has already done one far better that I could. Read hers first, then come back here. Don't worry, I'm a lowly VPS, I can wait. As with each of her race queen renditions since 2010, it's seemed like an age since we first saw the unpainted sculpts of Good Smile Company's 2013 Racing Miku. I refer you to Plastikitty's report on the subject, complete with all the greymatter photographed for your reference. Wait, greymatter? Well we finally have some leaked painted images from Good Smile Racing, and I'm excited. I'm of course not referring to the paint leaking, that would be most unfortunate. I've been in situations where figs I've bought have paint issues; I've had to take them back to the greengrocer then admitted myself for blood tests. Ingesting paint is rarely (if ever) advisable, though you should always contact your doctor or healthcare professional rather than listen to me. But I digress. It's become a tradition for fans of the world's greatest virtual idol. 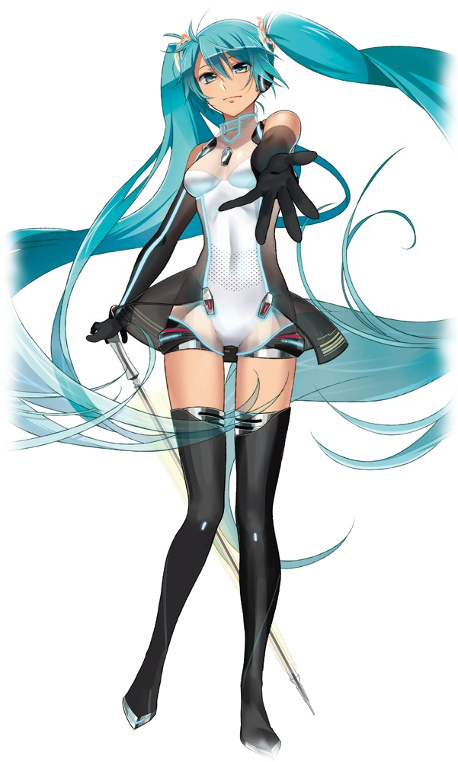 Each year since 2010, we get some "leaked" images from Good Smile Racing of Miku as their race queen mascot in her updated garb. Time passes, and we get some greymatter sculpts of some figmas, nenderoids and figures based on that artwork. With more time, we get painted previews of the figmas, nenderoids and finally the figures I'm interested in. Half a year after this, we can buy them. It's an absurdly maddening, brilliant marketing strategy. Speaking of marketing, Good Smile Racing also exhibits the same release schedule as Microsoft and Intel with their operating systems and chips. Since XP, the market seems to like one version of Windows, then loathe the second. Intel releases their chips with a major tick, followed by a downscaling tock (is that the right order)? Now that I think of it, that latter analogy doesn't really work, please disregard. It seems Racing Mikus released in odd numbered years are cool, elegant and more mature, whereas the even numbered years turn out more twee. I can't quite put my finger on it, but I'm certainly not alone in this observation. Clara's 2011 Miku stands above all else, but I think 2013 has a chance of following this tradition. Okay, enough about how I'm a hopeless nerd drawn in by marketing. Identifying such a trait is the first step, right? And as Homer would say, the last step, right? With a few small reservations, I'm really liking what I'm seeing so far. Her expression and pose don't quite match the cool class of 2011, but I think they still did her justice again this time. People clearly liked crown before, so this time they've enlarged it and made it look even more dangerous with its sharp metallic points. While I'm thinking of that, I was unsure how all that sharp metallic stuff in the illustration would look in figure form, but I think they pulled it off. Which is to say, they put it on. I'm intrigued by her individual skirt shards too; I call them shards because they almost resemble pieces of glass. If the effect is the same as her translucent, flowing hair that has made another welcome appearance in this fig, it'll look really amazing. 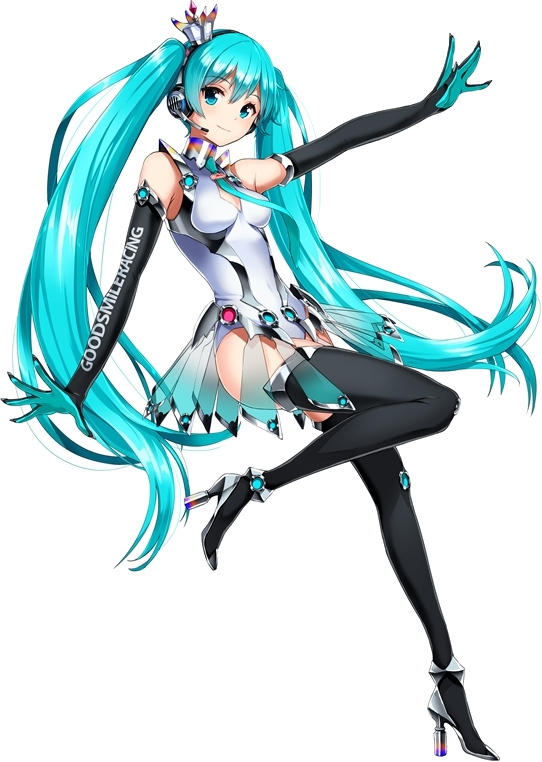 I'm also thinking it could serve a practical purpose; with these metal tipped shards all Miku would need to do is spin like a top to thwart her enemies. It's a refreshing change from any number of anime series where the protagonist's skirt is the first thing that gets shredded. You'd think by now they'd make them out of carbon fibre or something. In a racing setting, I'm thinking these metallic points everywhere could do some serious competitor tyre damage. In Good Smile Racing, there are no rules! My legal department has since advised me to inform my readers that Good Smile Racing adheres to racing rules.